You don’t have to leave home to have a good time. When the weather cooperates, take the family outside and try some of the following four games and sports that you can easily play in your own backyard. Twister can offer hours of indoor fun, but take the fun outside to enjoy this classic game along with a few breaths of fresh air. You can either use the traditional Twister game sheet and spinner or make a game surface yourself. You’ll only need spray paint and a flat patch of grass. Consider using coupons for Nike shoes to get every family member a pair of comfortable sneakers. 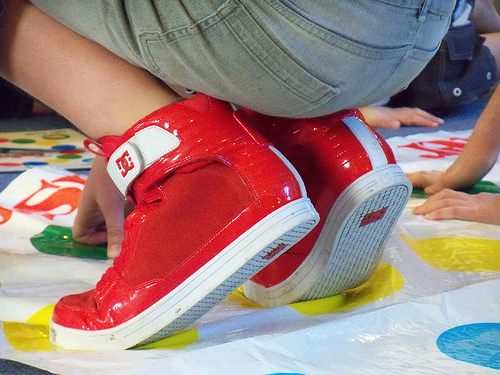 Closed-toe shoes help players keep their balance as they strike their positions on the Twister board. Additionally, if you have a large family and you choose to make your own Twister game, you can design the game surface as large as you like for more fun. Families have played toss games for years. Try your hand at horseshoes or give bean-bag toss a try. Either way, you’ll get a little exercise without running everyone ragged. Toss games also help kids develop hand-eye coordination, which can help them if they decide to play sports in the future. Use an official game set or make your own. For example, you might use empty paint cans and sandbags or stakes in the ground and round discs. Each family member challenges the others until one winner stays standing. You don’t need a full football team to throw the ball around in the backyard and get some exercise with the kids. Consider cutting holes of different shapes in a large tarp. The family splits up — half on each side — and each player takes turn throwing the football through one of the holes. Make the holes larger or smaller depending on your children’s ages. You can also use a foam football instead of the harder variety. To protect your family members’ feet and support a charity of your choice, search for Nike deals through Coupons For Good to outfit everyone in durable footwear, save money, and help a deserving organization fulfill its mission. Kids love to find hidden objects, so why not give them a reason to do it? Hide items around the backyard, then prepare a list of the items they need to find. Alternatively, give each child a list of objects they might naturally find in the backyard, such as ladybugs and twigs. For little ones, consider simplifying the scavenger hunt. For example, ask them to find something that represents every color of the rainbow. The adults can get in the game, too, for full-fledged family fun. If your kids love photography, ask them to take pictures of what they find instead of collecting them in a sack or basket. You don’t have to leave the house to play games and sports with the kids. Give the above suggestions a try. And if your family members need new shoes that are up to the task, you can search for Famous Footwear coupons on Goodshop. Getting everyone active can happen in your own backyard.